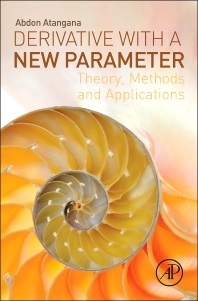 Derivative with a New Parameter: Theory, Methods and Applications discusses the first application of the local derivative that was done by Newton for general physics, and later for other areas of the sciences. The book starts off by giving a history of derivatives, from Newton to Caputo. It then goes on to introduce the new parameters for the local derivative, including its definition and properties. Additional topics define beta-Laplace transforms, beta-Sumudu transforms, and beta-Fourier transforms, including their properties, and then go on to describe the method for partial differential with the beta derivatives. Subsequent sections give examples on how local derivatives with a new parameter can be used to model different applications, such as groundwater flow and different diseases. The book gives an introduction to the newly-established local derivative with new parameters, along with their integral transforms and applications, also including great examples on how it can be used in epidemiology and groundwater studies. Abdon Atangana’s serves as Professor at the University of Free State in Bloemfontein, South Africa. He specializes in applied mathematics, groundwater modeling, fractional calculus and their applications, methods for partial differential equations, methods for ordinary differential equations, iterations methods, asymptotic methods, perturbations methods, and numerical method for fractional differential equations, uncertainties analysis. He has participated in 18 international conferences, organized 6 special sections and symposium in international conference in Europe, Africa, Asia and USA, and has been invited as plenary speaker in 8 international conferences. He serves as editor for an international journal of applied mathematics and is the editor-in-chief for two international journals. He has authored more than 145 research papers in international accredited journals of mathematics and applied mathematics. His previous book, “Derivative with a New Parameter: Theory, Methods and Applications”, was published with Elsevier Sep-15, 2015.